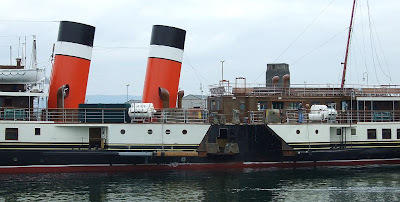 Having been in the hands of the Garvel repair yard since her return from Oban, WAVERLEY, billed as the 'last sea-going paddle steamer in the world', was today towed out of the drydock by two of Clyde Marine Service's tugs, BOOJUM BAY and BITER. During her spell in the drydock, a problem was discovered with WAVERLEY's port paddle shaft, and both the paddle wheel and the shaft itself have been removed while remedial work is undertaken. As a result, WAVERLEY's port sponson presents a somewhat unusual appearance. WAVERLEY was towed into the James Watt Dock and berthed bow-to-bow with JUPITER, due to enter the drydock shortly for her own survey. When the paddle shaft is ready to be refitted, WAVERLEY will return to the drydock. In the meantime, her scheduled late spring visit to the Bristol Channel has been cancelled, and her consort BALMORAL will be undertaking some of her sailings. 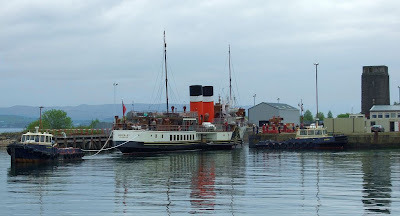 It is hoped that WAVERLEY will be able to take up service in time for the star of her Clyde season in mid-June.